Raising a glass and making toasts with a sparkling Greek wine, could lead to a wonderful moment. Let’s Blink. 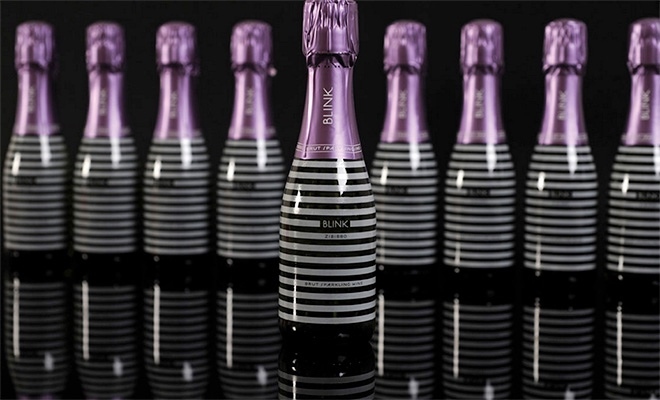 Immediately you will know that Blink is one of the most ‘hip’ sparkling wines around. You can see this with the fashion forward design of the bottle an label. It is no surprise that this creative design was awarded the Golden Pentaward Metal in packaging design in 2011. But don’t think of Blink as just a pretty face, don’t look away—she is just as beautiful on the inside as the outside. A delicious wine that received 90 points and a ‘Best Buy’ recommendation in the 2013 August issue of Wine and Sprits. Blink Wine is a product by a butique winery from North Greece, called Pieria Eratini. Blink is a dry sparkling wine from 100% Muscat Alexandria (Zibibbo). Today I drink it at a perfect 7 degrees (whites should be at 6-8 degrees Celsius). In opening the bottle, one immediately can appreciate the aromatic nose. This bottle/glass of wine is clean with no visual defects . Pale yellow and bright in color with a nose of almond, almond blossoms, peach, pear and citrus. There is even a hint of the yeast. The palate follows the nose and one feels a mouth full of flowers which is followed by a slight fruitiness, especially the pear. It’s mild acidity and minerality balance the sweet flavor that comes on the front of the mouth with an aftertaste of buttery or toffee candy such as a caramel.